But the seed had been planted. A smaller space was something that we not only could live with, we wanted to live with. When we got the green light for Mr. ThreeYear to work remotely, we had picked out a couple of towns in North Carolina near Charlotte that we were targeting. We didn’t care if the house was smaller, but we did need it to have an extra bedroom that we could use as an office, one that was hopefully tucked away a bit. We’d looked online extensively at houses in several different towns, but the problem with looking online is that you don’t get any idea about neighborhoods. So it boiled down to choosing our town, our house, and our neighborhood within one weekend. Initially, we planned to rent. But when we began looking at houses, Mr. ThreeYear said that with working remotely, he didn’t want to rent. He wanted to own the house where he was going to be working from and know that would be his office for the indefinite future. He didn’t want the uncertainty of renting and not knowing where we’d end up. We also realized, pretty quickly, that we only wanted to live in Davidson. Not only were the schools a little better, the town is so cool. It has a great downtown area, its residents are so invested in their town, and it has a well-known college. We’ve been to several events with the Davidson athletes and my kids love it. They even come out to events at the elementary school. 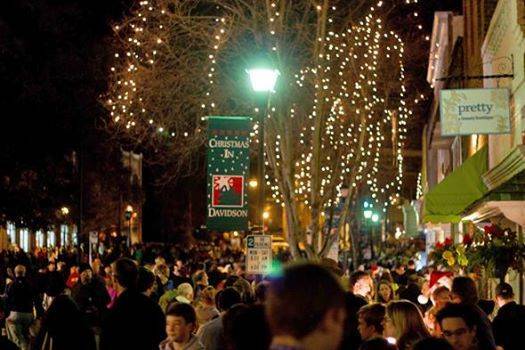 Davidson even has a 3-day over-the-top Christmas celebration, and you know how much I love the holidays. There are trolleys that ride us in from our neighborhood to the downtown area, Santa in a horse-drawn sleigh, a live nativity scene, carolers, and vendors (including my sister) who sell food and gifts along the street. 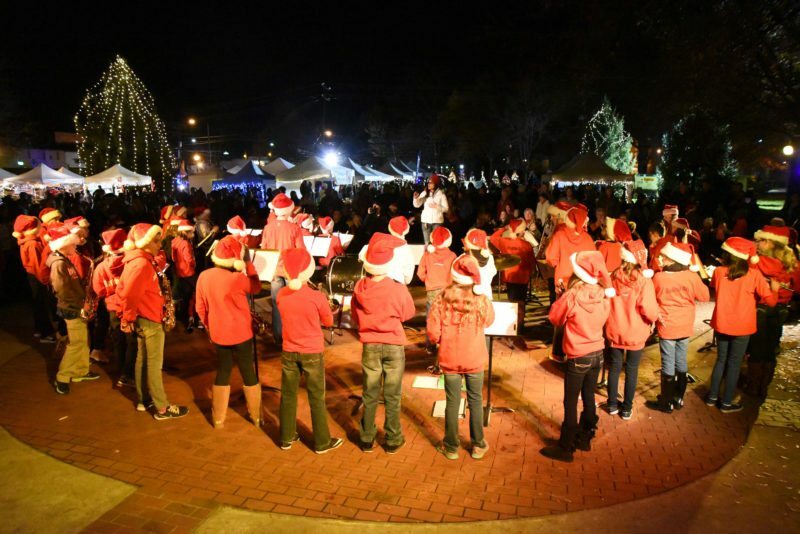 Carolers in Downtown Davidson during the town’s Christmas celebration. People and lights line the streets during the town’s Christmas celebration. 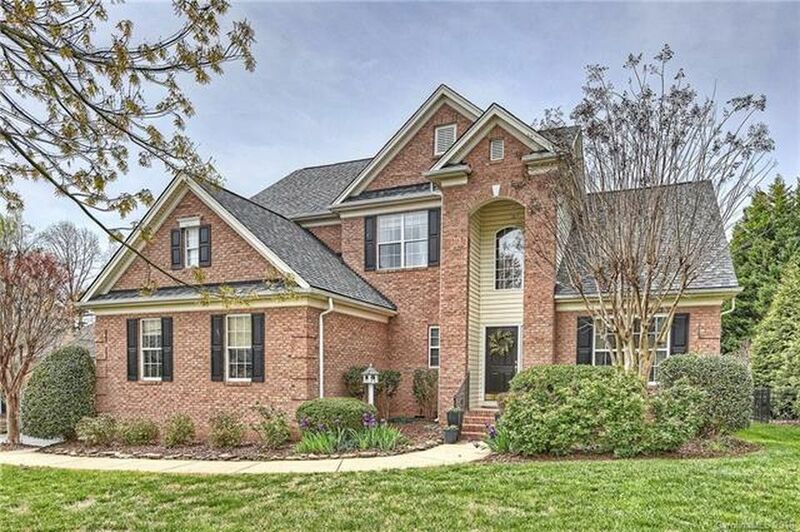 Once we had decided we wanted to live in Davidson, we toured the four or five houses currently for sale that were in our price range. And when I say “in” our price range, I mean houses more expensive than our own but not so exorbitant they made us gasp. We’re in the South, so these house prices have nothing on West Coast prices, but for us, they were much higher than we were used to. One of the reasons I wanted to rent was because there were so few choices. I knew that more houses would come on the market later in the year that would be better deals, but the inventory was currently low, so we didn’t have that much to choose from. After none of the houses that we saw ticked off the boxes in terms of location, size, and price, we got our realtor to look again at the MLS listings and print us out a listing of anything else we may have missed. She sent over a multiple-page document, and one of the houses on the list was our current house. We hadn’t considered anything in the neighborhood initially because we thought it would be too expensive, but there was one house on the list that we could afford, so we decided to go see it. As soon as we drove in the neighborhood, Mr. ThreeYear loved it. We toured the house, and it had everything we needed-it actually had five bedrooms, despite its “lesser” square footage (still very large at 2600 feet), a fenced in backyard (again, small, but nice), master on the main, and a two-car garage. Plus, we could afford a 15-year mortgage on it (without me getting a job), one of our non-negotiables. The house is all brick, and the inspector didn’t find any major (or really minor) problems in the house at all. He said it was well-built and solid. This house is enormous compared to the condos we were looking at in the Northeast, and it’s a totally different type of living than we would’ve had at the lake in New Hampshire. We’re in a suburb, and we do most of our activities (tennis, swimming, taking walks and bike rides) right here. In fact, we don’t leave the neighborhood much, since we’re working from home and the school bus comes and picks the kids up and drops them off every day. While it’s not the biking to downtown that I had envisioned as we looked at some houses closer to the town center, it definitely is a neighborhood-centered life. And since we like our neighbors, it’s worked out fine so far. We also had the option of buying a townhouse or condo in the town, but the townhouses cost almost as much as our house, with many less perks, so we decided a house was the way to go. As we get acclimated to the house, we’re figuring out how to keep our utility spending low. It’s amazing how much less it costs to heat and cool this house (and we also live in NC, so it’s a lot warmer overall). We’re still getting there, but I have a feeling that after a few years, I’ll see our utility bills go down significantly from New Hampshire. We have less yard, so that means less yard work. It is nice not to be constantly weeding my flower beds (well, I kind of have been constantly weeding, but they were left in bad shape. After a while they’ll be good). We’re all together more, too. We all hang out in the family room/kitchen area which is all open to each other, but we also have places we can go if we want to be alone (this is happening more and more to Junior ThreeYear, who’s entering that middle-school age). Junior ThreeYear’s new room, which he loves to hang out in. First of all, let me preface this section by saying I recognize that any downsides I write about going from a 3600- to a 2600-square foot house have privilege smacked all over. I make myself wake up every day and count the ridiculous amount of blessings I have in my life. I am graaatttteeeful for getting to live in this beautiful house, for being location independent, for having time freedom, and for having financial freedom. And I’m grateful for much simpler things, like having a healthy husband and kids, for being healthy myself, for having good relationships with my family, for having kind and wonderful friends. But if I’m being completely honest, once in a while I think to myself about our house, “where’s the rest of it?” I know I will get over this really quick, but we are so used to having a large basement at the bottom level of the house that we’re having to get rid of a lot of stuff that just doesn’t fit. And that’s actually a wonderful thing, because I believe in minimalism. And I KonMaried my old house and thought I had gotten rid of all the extra stuff. But I’d gotten rid of all the extra stuff that didn’t fit in that house, and now I’ve got to get rid of all the extra stuff that doesn’t fit in this one. There’s also a lot more clutter, because we have a long bar area in the kitchen, and nowhere to put all our mail, papers, etc., so we’re battling clutter all the time. I have started figuring out places for baskets, shoe racks, and hooks for our bags and shoes so that we can tame the clutter beast a little better. Part of it is just being in the house long enough to come up with solutions. All first world problems, I know. The mortgage is also larger by several hundred dollars, so we’ve had to get used to that in the budget. It means we can’t save quite as much as I planned at the beginning of the year, which bums me out, but I know we’ll get back there. Because we bought a more expensive house, we’re paying a lot more in mortgage interest, so it will take longer to reach financial independence unless we’re able to cut expenses in other ways. I haven’t run the numbers, but if we had stayed in our old house, it would have been paid off in nine years, and now we have fifteen years of payments left. It was a trade-off that we made consciously, trading financial health for emotional health. It’s hard to see any gains from that trade-off after less than six months, but I think that after several years we’ll see some major gains in our boys having access to more family and better counselors for their learning and social special needs, and in me getting less depressed since we have shorter winters and more human interaction. I hope Mr. ThreeYear will also make some good friends through playing tennis and develop a closer relationship with my parents, which he lost a bit during our eight years away. There’s a chance that this post might be one giant exercise in cognitive bias (ie, I made a decision and now I’m looking for reasons it was the right one). But the reality is, we bought a smaller, more expensive house, and now we’re living in it. Pretty happily. What’s the story on your last house purchase? i read this and started looking at housing and got distracted! 90 minutes later all i can say is i can’t believe what housing costs right now. i guess we’ve been spoiled by old architecture in our place. we lucked into it when the local economy stunk. the places i was looking at were near portland, oregon and built out of cardboard and duct tape in comparison this our current fortress. i’m glad you got a brick house, laurie. a neighborhood is important to me too if i’m going to have neighbors. i want to walk to get a haircut, a cup of coffee or a bite to eat. I love having neighbors! It’s been great. I have made a lot of friends and my happiness level is really high, gotta say. Houses in Portland–can you believe it? It’s insane. Yes, I saw them being built out of cardboard and duct tape, too. For $650,000. NY real estate is a little insane too, right? Our inspector said our house is solid. I do love the South for the brick. You can’t hear much outside our house–it’s very well insulated, even for being “old” at 20 years. Ha.